There is a disconnect between polling signals we are seeing on Obama's candidacy for the second term and what the markets are telling us. The latest polls have Obama disapproval rising to 50%. Rasmussen polls have Romney ahead of Obama 46-43 in a head to head contest. And rising gasoline prices seem to be the key issue behind those disapprovals. Washington Post: Disapproval of President Obama’s handling of the economy is heading higher — alongside gasoline prices — as a record number of Americans now give the president “strongly” negative reviews on the 2012 presidential campaign’s most important issue, according to a new Washington Post-ABC News poll. Gasoline prices have certainly risen, as the futures chart below shows. 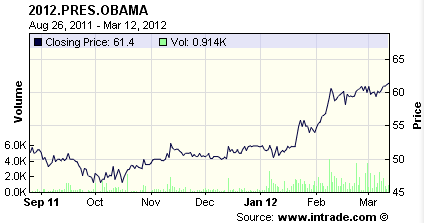 But so have the odds of Obama being reelected on Intrade in spite of all the polls. The odds are now at 61.4%, the highest since May of 2011. There doesn't seem to be any evidence that gasoline prices are hurting Obama's chances (so far). People often have a visceral reaction to these types of Intrade odds, particularly if it goes against their political views. However, like in any market, those who don't agree with it can bet against it (for example if you don't like the Dow at 13000, you should sell/short it.) So far that hasn't been the case with these Obama contracts. What this means is that gasoline prices are aggravating poll respondents who give Obama a high disapproval rating. But if asked who they would bet money on (effectively who is most likely to be elected, not who they would vote for), the answer (if answered sincerely) would be Obama 61% of the time. This once again points to the unreliability of political polls when it comes to assessing election odds.